Join Vicious and Delicious, a group of friends from the US and Canada, as they traverse Kilimanjaro, the world’s largest freestanding mountain and one of the Seven Summits, by the Umbwe route. 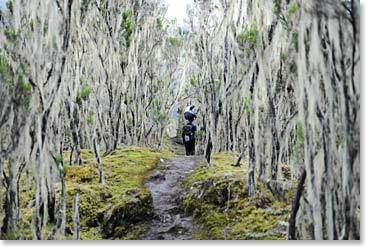 This Berg Adventures alternative to some of the more overcrowded Kilimanjaro routes traverses the most beautiful sections of Kibo’s southern flanks. This group of adventurers will trek through the plains of Tanzania, to the rainforests and dry alpine deserts, up to the glacial arctic conditions at the top of the mountain where they will attempt to stand on the top of Africa. Follow our daily dispatches as this group of friends walk through the most pristine and quite forest trails of the Umbwe route as they make their attempt on this great mountain. After their climb of Kilimanjaro part of the group will return home while others will join Berg Adventures Safari Guides on a wildlife safari. The group will travel to Tarangire, Ngorongoro and Serengeti to view the spectacular wildlife that northern Tanzania has to offer. They will even take part in a balloon safari! October 5, 2013 – Vicious and Delicious All Reach the Summit!